At Bidibot, players can already get hold of an array of online gambling credits and tournament buy-ins at their favourite online gaming sites for a fraction of their true cost and now even the losing bidders will get something in return. 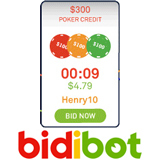 Now online penny auction site for gamblers, Bidibot.com, is giving even more incentive to bid after setting up a new Rakeback feature on their auctions. The new feature will see the second place bidder, on auctions such as 888Poker and Betfair Sport packages, refunded a percentage of their bids placed. It's not just poker goodies that can be won for peanuts at Bidibot.com. The site also offers auctions for hi-tech gadgets such as iPads, iPhones and Nintendo Wii consoles. The latest player to bag such a bargain was lucky bidder “TheHulk” who got an Xbox 360 at a knockdown price. “TheHulk’s” bidding rivals were green with envy after he picked up the gaming console for just $2.01, that's a saving of over 99% on the RRP of $270. The next gadget auction is scheduled for Saturday 30th October when one lucky bidder will take home a Nintendo Wii for a bargain price. In the meantime there are a host of poker and sports betting related auctions from the likes of Betfair, 888.com, PokerStars, Victory Poker and GCasino with packages worth up to hundreds often going for just a few dollars.